Very soon now, my son, Timmy, is going to be a father all his own. 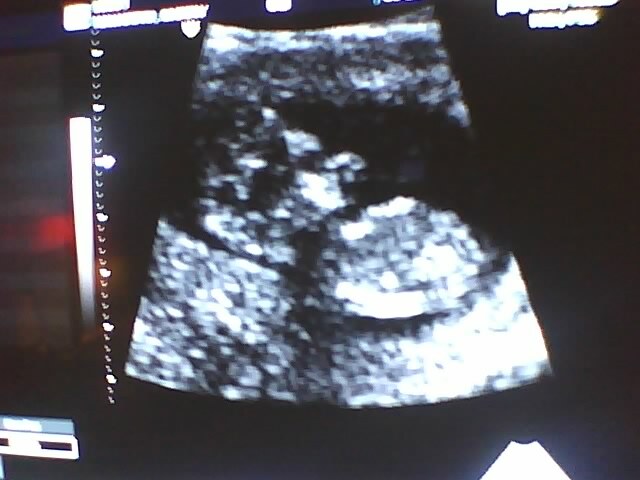 Here is one of the first pictures of his little one. And the tummy you’re looking into belongs to Carrie, who I have heard a lot about and can’t wait to meet. When I found out she was pregnant, I got so excited I made Timmy put her on the phone and chat with me, which was probably the wrong thing to do, because she sounded sleepy. But she was kind and sweet to me, and we made small talk. I can’t wait to meet her. I can’t wait to hold this little baby. Hahahaha My main man Popps! I am very excited, an at the same time a little bit scared, hahaha another Elhajj, look out now!Hahaha Na I’m just jokin. This baby has so much love coming towards him or her everythings gonna be alright! Thanks Dad. I love you buddy. Keep up the writing, you got a lot of fans! Your energy and enthusiasm for fatherhood is just a joy to watch, Tim. Those are probably the two things you need the most to be a good father. Ah, Tim. I assume this is your first grandchild… If so, congratulations! If it’s not, congratulations anyway. I never wanted the title Grandmother; it sounded too old to really be *me* if you know what I mean. But now that I am one, I simply adore it. Don’t call me Grandmother or Grandma, though. I prefer Nana (Australian) or Obaachan (Japanese). Truth is my grandchildren will probably call me something they invent themselves and I’ll be charmed into them calling by any name. Have fun in your new role! I am a Great Uncle or something, but this is my first grandchild. I am so excited. I don’t care what they call me as long as their eyes light up when I appear at the door.